General view of a lunchtime protest will at Belfast City Hall, which is being supported by activists from Amnesty International and a range of other civic society groups in protest against American President Donald Trump's visit to England today - Credit: by Kelvin Boyes / Press Eye. 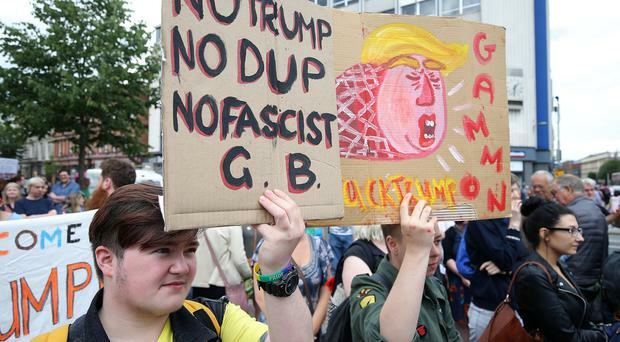 Press Eye - Belfast - Northern Ireland - 13th July 2018 General view of a lunchtime protest will at Belfast City Hall, which is being supported by activists from Amnesty International and a range of other civic society groups in protest against American President Donald Trump's visit to England today. Photo by Kelvin Boyes / Press Eye. Press Eye - Belfast - Northern Ireland - 13th July 2018 Patrick Corrigan from Amnesty joins the lunchtime protest will at Belfast City Hall, which is being supported by activists from Amnesty International and a range of other civic society groups in protest against American President Donald Trump's visit to England today. Photo by Kelvin Boyes / Press Eye. Tens of thousands of protesters swarmed the streets of central London during Donald Trump's first visit to the UK as US president. Organisers of the Together Against Trump mass demonstration claimed they had been told by police that more than 100,000 protesters had joined the march by mid-afternoon. Aerial views showed densely packed crowds gathered at Portland Place and filling Oxford Street and Regent Street ahead of a rally at Trafalgar Square. The Metropolitan Police said it would not give an estimate of numbers in attendance, but MPS Events tweeted that such was the scale of the crowd that stallholders in Trafalgar Square had been asked to take down their stands "to maximise the space available". Celebrities including Stephen Fry and James Bond actress Samantha Bond tweeted their support for those marching, while Downton Abbey actress Laura Carmichael joined the crowds. Politicians including former deputy prime minister Sir Nick Clegg and ex-Labour leader Ed Miliband said they would be taking part in the protests. 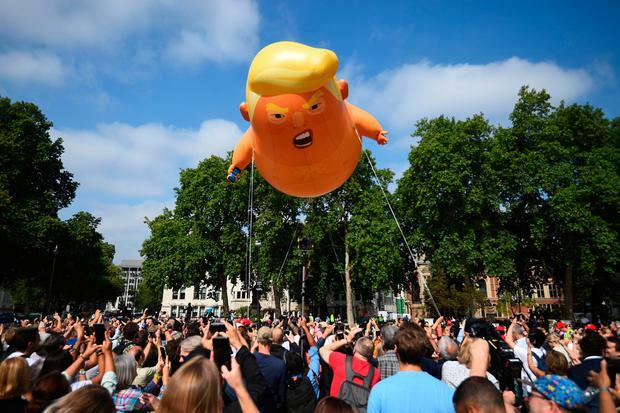 The day of demonstrations began with a giant blimp caricature of an angry baby Trump being flown in Parliament Square. While the president did not personally witness the blimp's flight, he did say it had made him "feel unwelcome" in the capital. Protesters said it was an accurate representation of his politics, which Mexican Paul Fonseca (23), of Camden, north London, described as "so immature". The Together Against Trump march followed the Women's March, which used the hashtag Bring The Noise, earlier in the afternoon, during which pots and pans were bashed and chanting erupted from the crowd against a backdrop of drumming and cheering. Immigration, the treatment of refugee women, equal rights for women and people of different sexes were among the topics raised and organisers of that demonstration said more than 80,000 people had turned out. In Belfast, hundreds of people flocked to City Hall to signal their own opposition to the visit. Addressing the crowd, Jennie Carlsten from Exact (Expat Action Group) said: "As an American, I know that most people here know what it is like to have a government that doesn't speak for you, that refuses to do what is right, and sometimes even refuses to turn up and represent you. "More Americans didn't vote for this President than did, and we should never forget that." Student Tom Prior travelled up from the Republic to show his solidarity. He said: "We cannot allow this man who is vile, full of bigotry, who is a racist and a misogynist to feel welcome. "People all over the world cannot stand him and we need to take a huge international step to ensuring that he is not welcome, just as he makes people who are from outside the United States unwelcome." Samantha Woolley, who brought along her three-year-old son, said: "I have come along today because I want to show my son that sexism, fascism and racism is wrong and that it is not welcome in the UK." Local politicians also attended the demonstration to show their solidarity. Alliance Councillor David Armitage said: "I am just exercising my democratic duty to protest when I see things are wrong. And like in Belfast I have done a lot of work with the Islamic community and the Jewish community and other minority groups, so I want to see a more diverse, multi-cultural planet and I see Trump as being against that." Belfast People Before Profit councillor Gerry Carroll said: "The message goes out today that Trump is not welcome. "He is not welcome in Belfast, Dublin, Cork, Galway, anywhere in Ireland, and if he tries to come here he will be met with more protests, and more people will come out on to the streets."